step off the private jet and on to Hahnenkamm. Every January the renowned Hahnenkamm World Cup Downhill ski race is held at Kitzbuehel (Kitzbühel). This race attracts ski racing fans from all over the world and has a festive air and the kind of significance that compares to the Running of the Bulls in Pamplona or Mardi Gras in New Orleans. So as long as you can handle large crowds and an excessive amount of partying, it’s a great time to visit Kitzbühel. The rest of the season, the town—and skiing for that matter—is much tamer. When bedecked in fresh snow, this Austrian Tyrol resort is a storybook winter wonderland complete with narrow streets, candles burning in the windows, and the constant jingle of bells on horse-drawn sleighs. Kitzbuhel’s Old World charm draws an elite international crowd that can be likened to the rich and famous that frequent Aspen or Vail–but at about half the cost. This former silver mining town, which dates back 700 years, lies at 2,600-plus feet (or 800 meters) above sea-level, and features breathtaking scenery reminiscent of scenes from the Sound of Music. Non-skiers on a Kitzbühel ski vacation have plenty of activities to do, from ice-skating and curling, to exploring the area’s many winter walking trails, and of course, everyone will enjoy exploring the town’s charming streets and stopping in at the many upscale boutiques, galleries, restaurants and bars. “Kitz,” as the locals call it, boasts a storied ski history. Over a century ago—in the winter of 1893—skiing began in Kitzbühel. 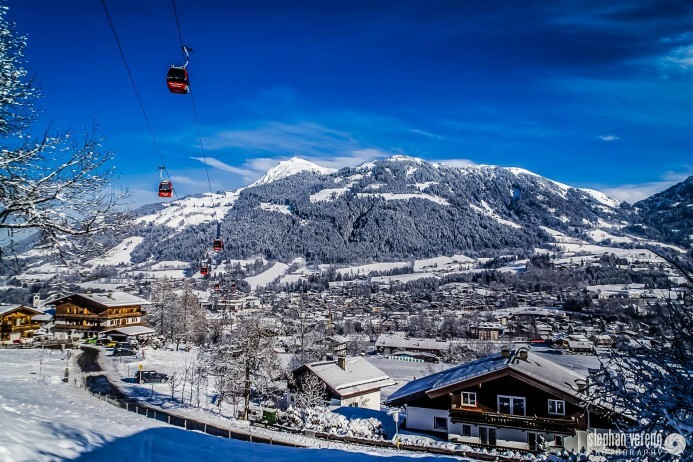 Consistent northwesterly snow provides Kitzbuhel with a reliable snowpack from December to April, but because the bottom section of the resort is situated at 2,640 feet the snow conditions can be variable. However, investments of 250 million Euro over the last couple of years have improved that issue immensely. Beginners and intermediates should not let Kitzbuehel’s status as host to the most difficult World Cup event intimidate them. The Hahnenkamm is leaps and bounds ahead of the rest of Kitzbuehel’s terrain, in terms of difficulty. In fact, Kitzbuehel is considered an intermediate skier’s paradise. Visit this Tyrol winter wonderland this ski season. A 6 seat Cessna Citation CJ2 jet from London to Salzburg (50 miles away from Kitzbuhel and the closest airport) is approximately 1 hour 45 minutes. A larger 8 seat Cessna Citation XLS will complete the journey in 1 hour 35 minutes. The transfer time by road is approximately 1 hour 15 minutes. Arranging a private jet charter or helicopter transfer with Freedom Air to arrive in style to Kitzbuhel is simple. The Freedom Air team can be reached on +44 (0) 1275 548001 to book your next trip.